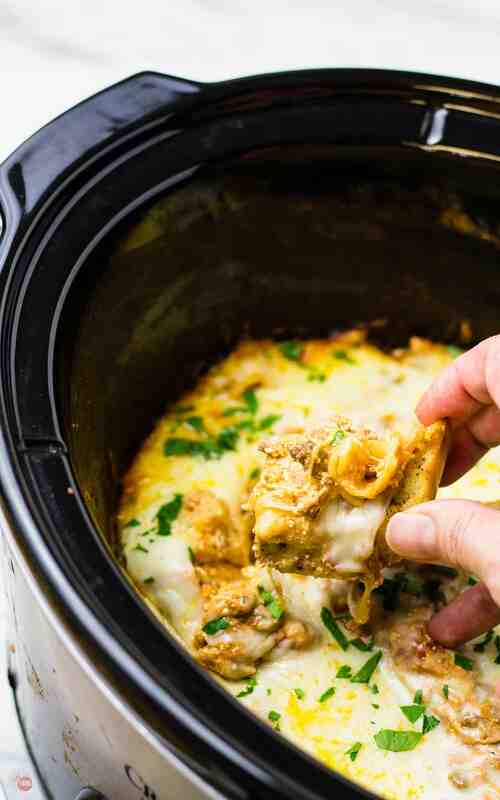 Dip your garlic bread into this extra cheesy Lasagna Dip made in the crockpot and perfect for a cold weather tailgating party! 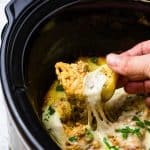 If you are still drooling over the Roasted Garlic Spread I posted yesterday and have garlic bread left over, here is an extra cheesy Lasagna Dip that you can make in the crockpot to finish it up! Garlic bread goes perfectly with pasta. Come to think of it, just about everything goes with pasta. And garlic bread! But let’s stick to the lasagna for now. Remember when I told you about the restaurant my parents owned when I was little? Well, Mama Leone’s made killer lasagna! I mean tall, stick to your ribs, loads of cheese lasagna. I love my mom’s version (the Mama Leone’s version) because it doesn’t have a lot of sauce in it, just a lot of cheese and meat. When we made lasagna for Mama Leone’s it stood about 5 inches tall and when we were repping it for serving we would pour a ladle of homemade marinara sauce over the top and a few slices of provolone cheese. A few minutes under the broiler and she was ready to be served. Extra saucy lasagna is just not in my vocabulary! This post may contain affiliate links. I earn a small commission for my endorsement, recommendation, testimonial, and/or link to any products or services from this website. 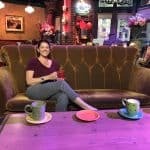 Your purchase helps support this blog at no additional cost to you and allows me to continue bringing you delicious recipes and funny stories. For my entire disclosure policy click here. Of course, when I make lasagna for my hubby he is not used to the Mama Leone’s style and prefers to have a LOT of sauce. Almost like a lasagna soup if you will. Having that much sauce means two things to me: 1. you are trying to cheapen the meal with less meat per person, and 2. you’ve never sold lasagna to customers who demand a lot for their money. Option 2 is understandable but option 1 is for the birds. With all that being said, when I was thinking of dips to make for tailgating season, I needed dips that were a little saucier than usual. Dips are meant to be scooped, smeared, sopped up if you will. Sopping means more sauce. This goes against my lasagna genes, and make me feel as though I am betraying Mama Leone but I will do it for the sake of the dip. SO, lasagna is on the menu but who wants to spend all the time baking and fussing? Well, let’s bring in the crockpot (have crockpot will travel) and let’s add something all the other Lasagna Dips are missing for some reason. Pasta! 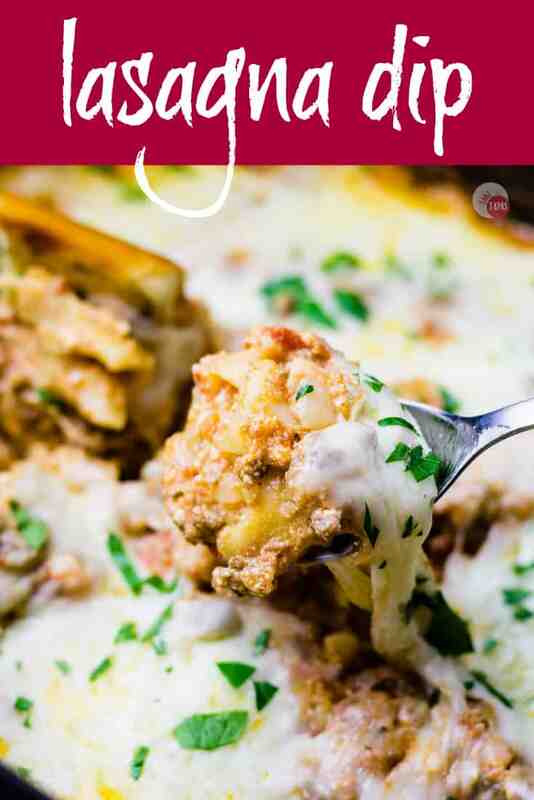 This is a Lasagna Dip so why are we leaving out the pasta part of the lasagna? I know why people leave it out because no one wants to cook it beforehand and then clean up the mess that comes with it. I am with you on that front! I hate cleaning up the pot I boiled pasta in and the colander has way too many holes to scrub individually! To forgo the cooking process of the pasta part, I use oven ready pasta sheets. There are plenty of pasta brands out there that sell the oven ready or par-cooked versions. I chose Barilla over the others because the pasta sheets were a little smaller and completely flat. And, they don’t have the ridges on them like the other brands. The par-cooked pasta versions are thinner and can cook in the slow cooker with minimal liquid which is perfect for dips and soups. 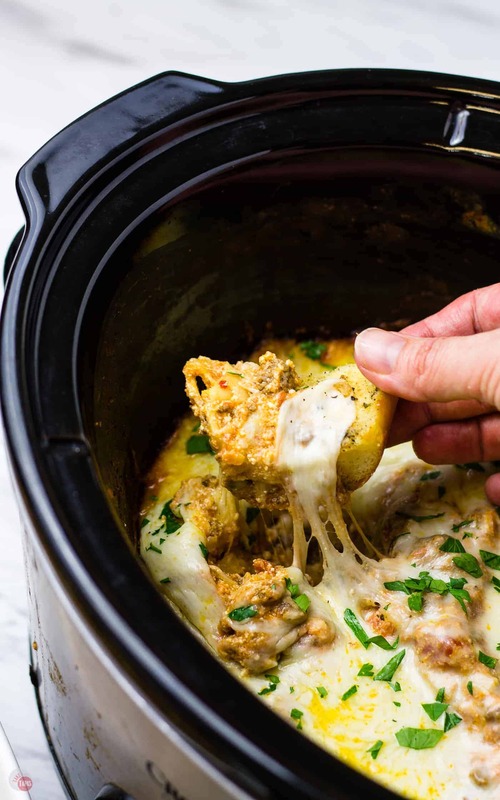 To make the Lasagna Dip we just have to toss everything in the crockpot and let it do its slow-cooking magic. The only real prep you need to do is to brown your ground beef (or turkey if you want) ahead of time and drain out the fat. 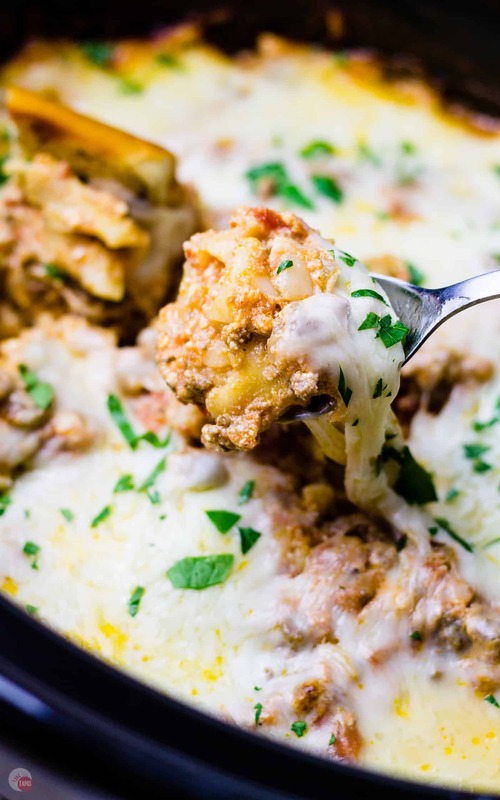 I add a chopped onion and Italian seasoning to my Lasagna Dip too (it wouldn’t be lasagna without Italian seasoning) to the ground beef while I am cooking it. This is optional and you can add the onion and spices when you are assembling the dip. I prep a few pounds of ground beef at a time and freeze it in one pound packages for easier meal prep and when I do I usually add a chopped onion and at the very least salt and pepper. 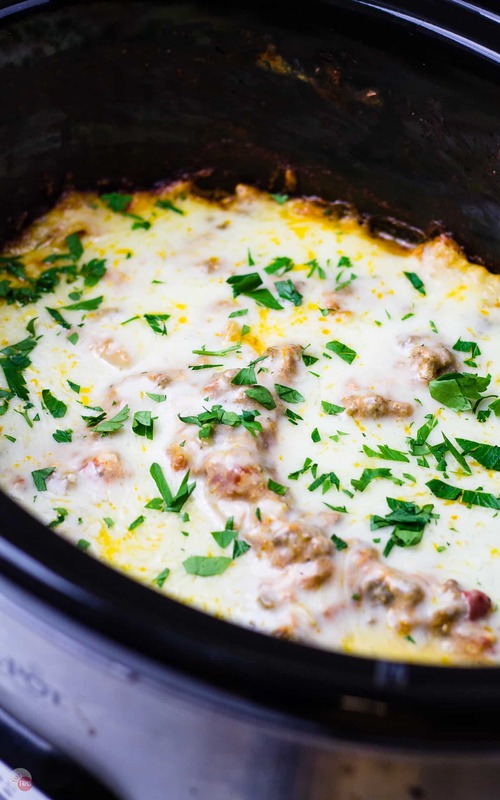 Then, when I am ready to assemble the Lasagna Dip, I just grab a pound of beef out of the freezer and toss it in the crockpot with the sauce, cheeses, and pasta. Voila! A slow cook on low for 1.5 to 2 hours and you are presented with a crock pot full of dippable lasagna! Scoop it out with a spoon, use some Gourmet garlic bread, or some sea salt bagel chips! The lasagna dip is thick so make sure your dipping apparatus is sturdy! In a crockpot, combine the cooked ground beef, onion, ricotta, tomato sauce, Italian seasoning, and 1 cup of the mozzarella cheese. Break the lasagna noodles into bite-sized pieces. Sprinkle the noddles around the crock pot and stir to mix them in the sauce mixture. Use a spoon to spread the dip evenly in the crockpot and level it out. Sprinkle the remaining 2 cups of mozzarella cheese over the top of the dip mixture. Cook on low for 1 1/2 to 2 hours or until the cheese is all melty and stretchy and the noodles are soft. 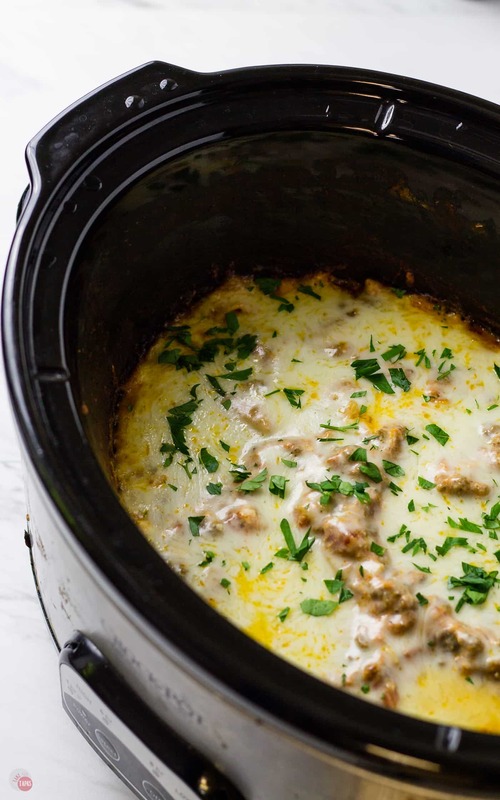 Turn the crockpot to warm, garnish with parsley, and serve with garlic bread or other dippers! *I like to cook my ground beef with the chopped onion and Italian seasoning all together. This is optional and the dip will still turn out perfect if you prep them all separately. Delicious and so easy. Served with toasted baguette slices. Yum! I am so glad that you liked it!! Thanks for being a loyal reader! This is probably one of the most mouthwatering and tempting dips that I have ever drooled over. It also begs the question of “Why didn’t I think of this before? !” Thanks for pointing out the obvious, Jen. Can’ wait to put this on our game day table of eats!